You may have noticed that I bang on about the seasons here in my little corner of the internet. It’s actually not at all intentional but it’s funny to look back and see what I consistently take note of and I seem to love what each new season brings but at the same time Spring and Summer hold the sweet spot in my heart. It’s mainly because the British weather is generally generous enough to allow for more time in nature even if that’s just in people’s thriving gardens. Come Autumn/ Winter all the greenery is slowly lost to make way for skeleton branches and barer horizons. This got me thinking about ways to bring the plant life inside in this bleaker months, to fill your home with a much needed dollop of nature. Now I do love a good houseplant, don’t get me wrong but there’s only so many I can manage at a time without killing them and in all honesty I’m not doing great on that front at the moment at all but let’s not speak about such murderous traits of mine. I felt thoroughly inspired by all these beautiful pressed plants, monograms and illustrations that make greenery a striking feature in the home. Try using clear glass frames to show off pressed plants with a more contemporary feel. Go one step further and layer them to add depth to a room. It almost looks like you could push your way though to a magical forest beyond. All this nature pondering coincided with receiving a beautiful package last week from Katie, the lady behind A Playful Day who’s recently started her #lifeoffscreen project. It’s basically seasonal snail mail (drop her an email to join in). Anyway, I was literally just mulling over pressing some plants and flowers again for the first time in about 20 years, and there wrapped in a pretty bundle of tissue paper were Katie’s pressed pickings. So I went and grabbed a bundle more ferns from the park and am now eagerly waiting to use them in some kind of DIY project for you all. Hurry up little ferns! 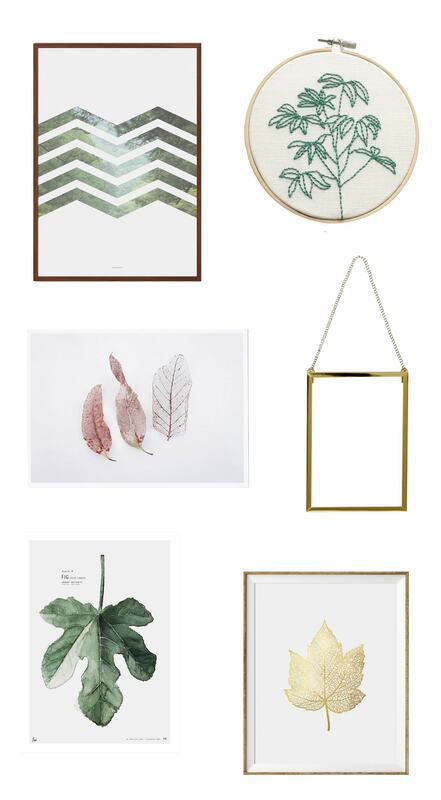 Here are a few items I love, to hopefully get you going inspired to bring the greenery inside. All beautiful I’m sure you’ll agree.